Zag is a young ZONKEY (half zebra, half donkey). As a young ZONKEY, Zag hears a lot of comments by young zebras who make fun of his long ears, buck teeth and skinny legs. He doesn’t look like the other zebras, but Zomma and Zadda always tell him he is special and that he can offer something to the herd that no one else can. He has a unique stripe pattern that helps fight off outside predators and he tries to think about how he can remain a true herd mate. Zadda is a purebred donkey . He is married to Zomma a loving, kind zebra who he met at Serengeti University. They have two zonkey children, Zag and Zig. Everyone stared and laughed at Zadda the donkey when he entered the Zebra herd because he didn’t look like everyone else. The other zebras would laugh and talk about the zonkey family behind their back. Zadda never talked badly about the other zebra families though and he spent time getting to know each zebra in the herd. Over time the other zebras started to look past his donkey looks and accepted him into the herd. Zadda thought is was important for Zig and Zag to see him committed to #herdwork so he spends much of his time during the day committed to helping the herd. He is always looking for opportunities to play with his zonkey children and use those opportunities to teach good herd lessons. Zomma is a committed Zebra Mom. She spends her day managing her Zebra work including grazing, collecting grass for her family while also watching over her sweet Zonkey children, Zag and Zig. Zomma is a pure bread zebra and is married to Zadda who is a donkey. She understands that her children are “different” and encourages them to be proud of who they are. She tells them that they each have strengths and they should always be themselves and treat others kindly (as they would want to be treated). Every day, Zomma tries to balance the desire to give her children the freedom to roam the grasslands and learn how to function on their own, while also understanding that poor decisions will lead to natural consequences that ultimiately could cost them their life. She is a loving, listening, positive, encouraging and disciplined Zomma who is committed to #herdwork. Zig is the youngest member of the Zonkey family. She is half zebra and half donkey. She is spunky, but insecure about her looks. She wants the other zebras to like her. 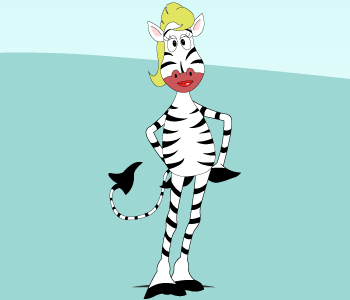 She too faces the challenges of having different physical traits that make her different from her zebra friends. All of her zebra classmates have perfect teeth and shorter black and white ears. Zig however is very smart and agile. She can easily outrun predators and teases the hyenas with her speed and change of direction. Zig is young and tries to do things on her own. Zomma and Zadda constantly remind Zig to be proud of how she looks and more importantly be proud of the person she is. Zanny is Zomma’s Mom. She lives with Zadda, Zomma, Zig and Zag. Zebras in general have very good hearing and eyesight and Zanny is no exception. She has been instrumental in helping the herd to survive. As the herd sleeps standing up, she uses her keen senses to warn the herd of dangerous predators approaching. Zanny NEVER seems to sleep and the herd is thankful for that! Zanny spends a lot of time talking to her zonkey family about how they may have different physical traits than the other zebras but that they each have strengths that they can bring to the herd (just a period). She encourages them to focus on those strengths and be proud of who they are. No two zebras have the same stripe pattern and that is what allows them to fight off predators like hyenas and lions. Raffa is a no neck giraffe. She is the only giraffe in the SERENGETI she knows without a neck. She, just like Zig, has been laughed at for not looking like her fellow giraffe friends, but they have a very good friendship and always stick up for one another. Raffa loves studying with Zig and wants to start a grass harvesting company one day, so the zebra herd and her future giraffe family will not have to travel so far to find food. She is driven and most of her giraffe friends get annoyed that Raffa is always wanting to study or work. Zig constantly reminds Raffa that this is an awesome strength. She tells Rafa that Zanny thinks Raffa is going to live a very long time because she’s always working and studying to make life better for her friends and family. Roto is a rhino without a horn. Roto lost his horn and lost his mom to poachers who wanted both horns to sell due to the high demand for rhino horns. Roto is one of the largest of Zag’s friends. By the time he is an adult, he’ll probably weigh 1000lbs. In the SERENGETI elementary school, Roto has to work very hard to complete his school work. He understands that this is typical since rhinos have a very small brain compared to the size of their bodies. Roto may not be as smart as the other SERENGETI animals, but he is very loving and is great at games. He spends a lot of time with Zag, Zig, Raffa and at times Lito. He is beloved by his friends and they take care of him since he doesn’t have a Mom. Lito is a young lion who was born without a tail. He is learning from his lion pride how to hunt for prey including the zebras. He is not always included in the lion pride fun because he is different from the other lion cubs. He doesn’t run as fast because he is always thinking about how he looks without the long distinct tail his fellow lions have. When the rest of the lion pride tease and chase the zebras, he doesn’t feel comfortable teasing them because of his own looks. He has met Zag and Roto and they have all talked about how they are all different in their own way. Roto and Zag hope they can convince Lito to discourage his lion pride from chasing the zebras and focus more on the impala or wildebeest.